Day after day, the farmer worked in his fields. He walked through the flooded fields following his ox that pulled his plow. The sun was hot overhead. His feet kept getting stuck in the mud. "Squish, squish, squish." Little leaches attached themselves to his legs while he prepared his fields. He had to stop and pull them off from time to time. "Ow, Ow, Ow!" He stirred the mud to prepare a bed in which to plant his seedlings. This was very hard work. When he was done, he was happy. He knew his fields would grow much rice. But, no sooner than the farmer had planted his last seed, large numbers of cranes came down to raid his fields and eat his seeds. The birds ate almost everything he planted. The farmer was no longer happy. He was very angry! The next day, the farmer plowed the fields again. He spent all day again under the hot sun guiding the plow pulled by the ox. His feet got stuck in the mud. "Squish, squish, squish!" He had to stop and pull off the leeches that stuck to his legs. "Ow, Ow, Ow!" The farmer again stirred the mud to prepare a bed in which to plant his rice seedlings. This was very hard work. But when he was done, again the farmer was happy. He knew his fields would grow much rice. He called to the birds of the air. "Please do not eat my seeds. After my harvest, there will be enough rice for all of us, and I will share it with you." But, no sooner than he had planted the last seed, large numbers of cranes came down again to raid his fields. Again, the birds ate everything he planted. For the third time, the farmer planted the fields. He spent all day again under the hot sun guiding the plow pulled by the ox. His feet got stuck in the mud, "Squish, squish, squish!" He had to stop to pull off the leeches that stuck to his legs. "Ow, Ow, Ow!" For the third time the farmer stirred the mud to prepare a bed in which to plant his seedlings. This was very hard work! But when he was done, again the farmer was happy. He knew his fields would grow much rice. But, before he planted his last seed, he prepared a giant net. 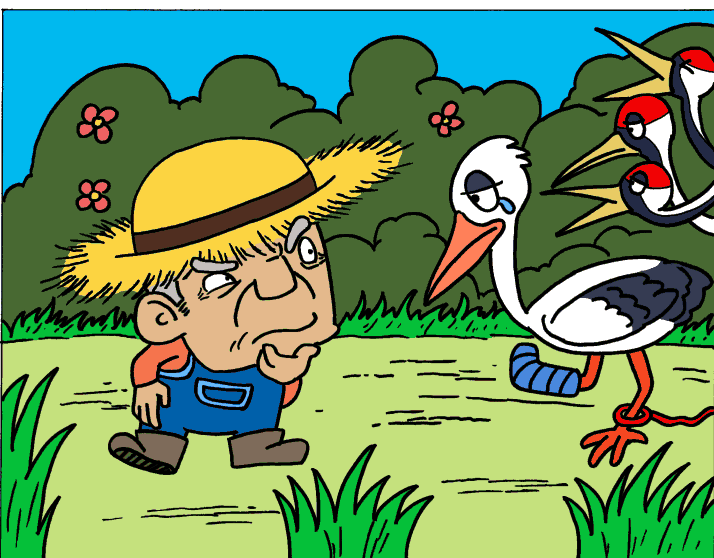 As soon as he planted the last seed, large numbers of cranes came down again to raid his fields and eat his seeds. But, this time, the farmer threw the net over the birds and caught them all! Three times they ate his seeds. Now, he would eat them. Along with the birds, the farmer trapped a Stork that had caught its leg in the net. The stork began to beg for its life. "Master," he said. "Let me go free just this one time. I am not an ordinary bird. I am a stork. I am a bird of excellent character. I work hard to feed my mother and father. I am not an ordinary thief like these cranes that steal from you." The farmer laughed out loud and said, "It well may be as you say, but I only know this. I have taken you with these robbers, and you will be served to my family on my dinner table with along with them."